3000 Leagues in Search of Mother (母をたずねて三千里, Haha o Tazunete Sanzenri) is a Japanese animated television series directed by Isao Takahata and aired in 1976. It is loosely based on a small part of the novel Heart (Cuore) created by Edmondo De Amicis, i.e., a monthly tale (racconto mensile) From the Apennines to the Andes (Dagli Appennini alle Ande), widely expanded into a 52-episode epic. The series was broadcast on World Masterpiece Theater, an animation staple that showcased each year an animated version of a different classic book or story. It was originally titled From the Apennines to the Andes. 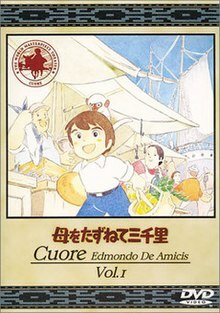 Nippon Animation, producers of World Masterpiece Theater, adapted Cuore into a second anime television series in 1981, although this second series was not part of the WMT. A summarization movie was released in the 1980s using edited footage from the TV run. Nippon Animation also re-animated 3000 Leagues as a feature-length film in 1999, with a theme song performed by Scottish pop superstar Sheena Easton ("Carry a Dream", which was included in her 1999 album called Home that was only released in Japan). The series was dubbed into several languages and became an instant success in some countries, such as Iran, Portugal, Brazil, Peru, Spain, Venezuela, Colombia, Germany, Chile, Turkey, Malaysia, the Arab world and Israel. In Hebrew, the series is called HaLev (הלב), meaning The Heart (the name of the novel that the series is based on, which was translated into Hebrew and was very popular in 1990s Israel). In some European and in Latin American countries the series is simply known as Marco. In Arabic the series was a huge success; it was called Wada'an Marco (وداعاً ماركو), meaning Goodbye Marco. The plot of the series focuses on Marco, a boy who lives with his family in the harbor city of Genoa, Italy during a depression period in 1881. Marco's father, Pietro Rossi, is a manager of a hospital who dedicates his time to treating poor patients, and therefore the family has financial difficulties. His beloved mother, Anna Rossi, goes to Argentina to work as a maid to earn money for Marco. When the letters from his mother stop coming after an indication that she is sick, Marco fears the worst for her fate. Since his father is too busy working in his clinic and his older brother Tonio was sent to train as a locomotive driver in Milano, he is the only one free to go search for her. Marco takes his older brother's pet monkey Amedeo and they sneak aboard the Andrea Dora, a ship bound for Brazil. In Brazil Marco boards an immigrant ship and arrives in Buenos Aires, where he meets a puppeteer called Peppino and his family, whom he knew from Genoa. They accompany him to Bahía Blanca to try to locate his mother. In Bahía Blanca, he discovers his uncle stole the letters which his mother had sent him. He returns to Buenos Aires and sails off on a ship to Rosario; there he tries to figure out how to get on a train to Córdoba. Marco's Italian friends collect money and buy him a train ticket. Marco arrives in Córdoba, and successfully finds the agricultural engineer Mister Mequinez. He tells Marco that his mother works for his brother in Tucumán and gives him enough money for a train ticket. But Marco ends up giving the money to a doctor to save the life of a poor girl he meets. Marco sneaks on the train, but he gets caught and tossed off in the middle of nowhere. A group of traveling Roma rescue him and give him an old donkey. After a few days, the donkey dies and Marco continues to walk to Tucumán. He eventually arrives to his destination hungry and tired, and finds his mother. His mother is very sick and needs an operation, but she is too weak. As soon as she sees Marco, she regains her strength and manages to go through surgery successfully. At the end of the series, Marco and his mother return to Genoa, where the family is reunited. Marco Rossi – a little boy, he is the main character of the series. Amedeo – Tonio's pet monkey, that comes on the journey with Marco. Anna Rossi – Marco's mother. Antonio (Tonio) Rossi – Marco's older brother. Pietro Rossi – Marco's father, a manager of a charity hospital in Genoa. Fiorina – Marco's friend in Italy and Peppino's second daughter; she assists her father in his puppet theater business. Peppino – a man who performs outdoor puppet shows for a living, with his daughters, Concetta, Fiorina and Giulietta. Concetta – Peppino's elder daughter, who controls the puppets in his puppet show. Giulietta – Fiorina's baby sister. 3000 Leagues in Search of Mother (母をたずねて三千里, Haha o Tazunete Sanzenri) is the movie edited by the staff of the anime television series. The theatrical release date was July 19, 1980. It was distributed by Toho Towa. It was screened at Toho Yoga group theater. The running time is 107 minutes. Marco: 3000 Leagues in Search of Mother (Marco 母をたずねて三千里, Maruko Haha o Tazunete Sanzenri) is the remake movie based on the TV animation series which Nippon Animation produced. The original staff did not participate in the direction and the script applied to the TV series. Moreover, under the influence of group negotiations to demand improvement of the voice actors, the original cast did not participate. It was ranked 81st in a Top 100 Anime list by TV Asahi in September 2005. It was also ranked 20th in a TV Asahi list of the favorite television anime of 100 celebrities in 2006. ^ "TV Asahi Top 100 Anime Part 2". Anime News Network. 23 September 2005. Retrieved 2 August 2014. ^ "Japan's Favorite TV Anime". Anime News Network. 13 October 2006. Retrieved 2 August 2014.